Communities that Capital Marketing publishes Coffee News in are listed in this Events section. If your community is not listed, visit our National site to look for your community. To search YOUR area of INTEREST click on “ctrl” and “f” then type in your community. At the Athabasca Seniors Centre. 10 a.m. to 2 p.m.
10 a.m.- 4 p.m. each day. Bottle Drive, Perogy lunch. $5/table or 3 tables for $10. Call 780-689-0803 or 780-525-2228 to reserve. Starting at 4:30 p.m. with singalong. Eating at 5:30 p.m. Card or board games to follow. Welcome anyone who doesn’t want to cook for one, or wants to make new friends, and would enjoy good company and fun. Bring a side dish, salad, appetizer, or dessert if you can, and a favorite game if you wish. Known internationally and loved locally, Chor Leoni Men’s Choir is recognized as one of the world’s vanguard male vocal ensembles. With stylistic grace and an adventurous spirit, Vancouver’s singing lions have enriched and transformed people’s lives through singing for twenty-five years. Aspiring to the highest professional standards, Chor Leoni performs annually to over 15,000 patrons. Co-Produced with DiscoverMusic@Augustana. More information here. Camrose Camerata adult chamber choir presents their annual spring coffeehouse. This event lets us showcase our talents with the full choir as well as with smaller ensembles and soloists. Join us as we explore music of the Dark – of night, of winter, of madness, and of perhaps a twisted sense of humour! Desserts and coffee included in the ticket price – $25 for adults, $10 for 16 and under (small children free). Tickets at the door or by calling 780-672-3372. Join us at Law Day on Friday, March 29 from 10:30 a.m. to 2:30 p.m. for live mock trials, holding cell tours, legal resource and information exhibits, Canadian citizenship ceremony, and more! Collecting donations for Lakeland Humane Society Bring basket for free surprise Easter eggs Glitter tattoos Crafts Photos Carnival Games Craft & vendor Market For more information contact Alex 780-545-0545. Event runs 10 a.m. to 4 p.m. Regular Wednesday market from 10:30 a.m. to 1:30 p.m. at the Mackenzie Conference Centre. Please contact us and we’ll post your local events! Submit yours here. This is for anyone experiencing personal or workplace burnout or would like more information about the symptoms and solutions. Join a group of like minded people and leave with strategies to move from burnout to breakthrough. Location: Four Points Sheraton Edmonton South. 7230 Argyle Rd. East 75 Restaurant Parlour room. Private room. 7-8:30 pm. Group meets first Monday of every month. All welcome. Learn beginner or advanced embroidery. We love to meet other textile enthusiasts. We meet the second Tuesday of every month, 6:30 to 9:30 p.m. at United on Whyte Church, lower hall. Visit our website www.edmontonneedlecraftguild.com or find us on Facebook. Antiques, collectibles, furniture, art and so much more. 100% funds to assist those in need. Organized by the Society of St. Vincent de Paul. Email ssvprita@gmail.com for more information about the event. Saturday, Apr. 6: 10 a.m. – 4 p.m.
Free admission. Family friendly event. Shop for housewares, home decor, art and supplies, tools, sporting goods, clothing and accessories, and much more! Conducted by Diana Wiens, seasonal classical and choral arrangements of hymns, including The Lord’s Prayer, Mendelssohn’s If With All Your Hearts, and the premier of Love One Another by conductor and compose Marlynn Rey, Lendrum Mennonite Church. 7 p.m. on Saturday and 2 p.m. on Sunday. Free parking, donations please. Join Merit Travel for an educational evening about the Arctic and beyond. Experience an IMAX screening of To the Arctic followed by an information session to make your dreams a reality! 100 of proceeds will be donated to our partner charity – WaterAid. Robertson-Wesley United Church 10209-123 St. NW. 12:10-12:50 Andrea Lastiwka Jim Findlay, guitars. They will perform Vivaldi, Mozart, Francis Cutting, Dowland, Campion, Jose Ferrer. Pay what you can. Join us for Law Day on April 13 from 9 a.m. to 3 p.m. at the Edmonton Law Courts Building! A free event for all ages, Law Day offers free legal resources, live mock trials, an identify theft presentation from EPS, and more! Visit www.lawdayalberta.com. Join us for our ‘new to you’ table, gift baskets, handcrafted items and home baking. Our youth group will also be selling muffins and coffee for $2. We are located at 6607 – 31 Ave, and our Spring Fling runs from 9:30 a.m. – 1 p.m. Happening at Strathearn United Church from 10 a.m to 3 p.m. We have a huge variety of clothing, housewares, china, jewelry, linen, crafts, books, toys, furniture, and antiques. Something for everybody! Check out the lunchroom. 5-10K Walk/Run, Little Gorilla Run, Costume Contest at 9:30 a.m. Run’s at 9:45 a.m. Kinsmen Club – 9150 Walterdale Hill. Come to our 7th Annual Spring Craft Market to be held on Saturday, May 11, 2019 from 10:00 – 4:00 p.m. at Mill Woods United Church 38 Avenue – east of 66 Street Our market is just in time for that perfect Mother’s Day Gift! Admission is free. A wide variety of free and low-cost programming takes place at the Strathearn Community Hall, 9511-90st: Dec. 13 to Jan. 10 – Board Games Bridge; Jan 17 – Family Games; Jan 24 – Scorsese Film Series. More events at StrathearnCL.org. This event is free and open to all the citizens of Edson. Music criteria must be kid friendly! Come and join us for some fun and awesome local talent! Doors open at 6 p.m. Event is three hours. Bethel Pentecostal Family Worship Centre at 6350 13 Ave, Edson. Paint & cut a modern mountainscape plus learn a variety of painting techniques with local artist Maddy Sharman. Tickets: https://www.edson.ca/residents/recreation-and-programs/youth-arts-and-culture-activities. 7 p.m. Location:Resol Place Hospitality Room @ 1021 – 49 Street, Edson. Jam City will take place every 3rd Saturday of the month. This event is free and open to all the citizens of Edson. Music criteria must be kid friendly! Come and join us for some fun and awesome local talent! Starting Sept 15 2018 thru to Jun 15 2019. Doors open at 6 p.m. till closing 10:30 p.m. Event is 3 hrs. All of our music sets are pre-selected and our genres range from classical to heavy metal. Our Facebook page is Jam City Edson – become a member today! Thank-you again for helping us, build for a better Future! Let the Music Play! The Fort Record presents Twin Flames Multi Award-Winning husband and wife duo Twin Flames combines Jaaji an Inuk/Mohawk from Nunavik and Chelsey a Métis from Ottawa. Together they take the audience on a musical journey across Canada and the Arctic. Two time Winners of the Canadian Folk music Award for Aboriginal Songwriters of the year 2016 and 2017 they push the boundaries of ‘Contemporary Folk’ and incorporate both Western and traditional instruments. Feature songs by Twin Flames are written in Inuttitut, English and French. Their goal is to further introduce people from around the world to their beautiful cultures, harmonies and powerful songwriting. 10 a.m. to 4 p.m. Come out and shop at Everything Handmade Markets on April 13 at the Dow Centennial Centre. We have over 50 handmade artisans, crafters and makers gathered to show you their very best Creations! Find a gift for that someone special or treat yourself. In lieu of admission, donations to the Fort Saskatchewan Food Bank gratefully accepted. (Both food items or monetary donations welcome) Stroller friendly event Free parking. The 22nd annual GP Sports Expo is April 5th to 7th, 2019 in the TARA Centre at Evergreen Park! Check out Western RV’s huge selection as well as the latest in boats, ATV’s, fishing, hunting, guns, baseball, travel and sports clubs! Test your fishing skills at the Contain Enviro Services fishing pool! There is laser tag and bouncy castles for the kids! Try out the batting cage! Enter to win a Twin Anchors houseboat vacation for 15 people! There’s something for everyone at the GP Sports Expo. Admission $10 for adults, kids 12 and under get in for free! If you are coming in from out of town and need accommodations please consider staying at Evergreen Park’s Preferred Hotel – Pomeroy Hotel & Conference Centre. Phone 780-532-5221 or visit their website at www.bookpomeroy.com. If you need driving services, the Park’s Preferred Driving Service is Executive Driving Services. Phone 780-978-7700 or visit their website at book@executivegp.ca. $15 entrance fee gets you three guest gardening speakers. Tea or coffee and home baked snacks. Located at the Lions Learning Center starting at 1 p.m. 9625 Prairie Road. Live and silent auction. Plants for purchase. All proceeds go to non-profit group. 5 - 9 p.m. at the Royal Canadian Legion Branch #249. 25th Annual Spaghetti Dinner and Silent Auction Fundraiser for the Yellowhead Emergency Shelter for Women Society, doors open at 5 p.m dinner at 6 p.m. Meat and meatless sauce, as well as, regular and gluten free pasta. Entertainment to be announced. Tickets will be available after February 1. The club now meets the second Sunday of the month, November through April, from 3-5:30 p.m., at the Hinton United Church (bottom level). Call Trudy at 780-865-5141 or Lori at 780-865-4673. The cost is $10 to dance, spectators are free. Hosted at the Leduc Recreation Centre. 44th Year of Make it… Bake it… Grow it! Thursday 12 – 6 p.m. Year Round Saturdays 11 a.m. – 5 p.m. Winter Only Enter to win $100 in market money each month. Free cake & coffee. Thursdays New vendors welcome. Presented by IG Wealth Management Dudding Group Wealth Management. Join us April 6 from 9-11a.m. at the Lloydminster Golf and Curling Centre for the free breakfast. Please RSVP before March 29. lloydminster.cavolunteerbreakfast 780-875-6184 Ext. 2919. Lloydminster Girl Guides are hosting their Strawberry Tea Bake Sale – Saturday April 13, 2019 from 2:00 – 4:00 PM at St. John’s Anglican Church Hall – 4709 – 49 Ave. Cost $4.00 per person. Tickets available at the door from Guiding members. Come join our society to help enhance, preserve and protect the watersheds in the Lac La Biche region. The Inaugural AGM is on March 26, 2019 at 7 p.m. in the Environmental Sciences Building at Portage College. Take part in the Easter Egg Hunt Only (11 a.m. – 12 noon) and/or the Kids Activities (11 a.m. – 1 p.m.) at the Morinville Community Cultural Centre (9502-100 Ave.) Contact Community Services at 780-939-7839 for more information. At the Al Adair Rec Centre from 10 a.m. to 2 p.m. Check us out on Facebook. www.peaceriverfarmersmarket.com Eat local, buy local. At 1:30 p.m., Broadway United Church Hall, 105 Broadway Ave., Regina. Bridge, canasta, Kaiser, etc., $8. Register in advance by calling 306-545-4011 or 306-545-6693. 100TH ANNIVERSARY OF THE SPANISH FLU To commemorate the centennial of the devastating global epidemic that exacted a death toll in the millions the Provincial Archives of Saskatchewan has assembled a special on-line exhibit. To view the exhibit visit saskarchives.com/collections/exhibits. Join us Saturday 10:30 a.m – 12:30 p.m at Sherwood Park Alliance Church gym. Everyone is welcome. It’s not necessary to contribute in order to receive. Drop off donations at the South gym after 4 p.m. on April 12. For information call Penny 780-416-8339. A group to discuss relationships, communication and personal Issues. Runs Tuesday evenings, 6:30-8:30 p.m. To learn more and for consultation call 780-449-6286. This group is offered free of charge. Registration open for the Art Society of Strathcona County’s Open Art Studio Tour. Open up your studio to the public for 2 days, June 22, 23, 2019. A great opportunity for local artists to show their work! Visit artstrathcona.com for details 780-449-4443. Gather with other writers to use a variety of prompts that result in new prose every week. This inspirational group is for writers of all stages and abilities. 6:30 – 7 p.m. Location: Spruce Grove Public Library 35 Fifth Ave Spruce Grove. Volunteers help lift our community! To thank those who generously give their time and effort to help lift up the tri-municipal region, local volunteers are invited to a Volunteer Appreciation Event on Saturday, April 13, in the Spruce Grove Hall at Heritage Park in Stony Plain. Presented by the Parkland Area Volunteer Action Committee (PAVAC), the event is free to attend and will include a screening of the 2009 animated feature film Up! Ice cream sundaes with toppings and a candy bar will be available for the first 400 guests. Doors open at 6:30 p.m. The movie will start at 7:25 p.m. Registration is not required. For more information, please call 780-963-8583. This event involves a partnership between the Government of Alberta, Volunteer Alberta and the Parkland Area Volunteer Action Committee. The St. Albert Lifestyle Expo & Sale is MORE than a Tradeshow! Discover a variety of vendors and services at the 2019 St. Albert Lifestyle Expo & Sale. This family-friendly event features a tradeshow with 200 exhibitors. There truly is something for every “lifestyle”. 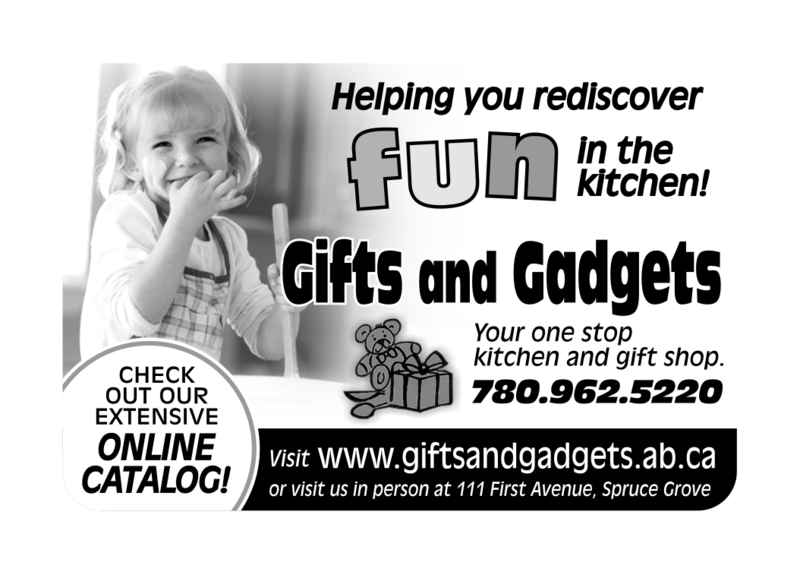 For the outdoor adventurist, walk into the Outdoor Lifestyle Experience; take a bite out of St. Albert at the Taste of St. Albert; enjoy the always popular Petting Zoo; “Stamp Around” the Expo with an interactive contest for kids and adults; cheer on the tiny contestants in the St. Albert Gazette Baby Crawl; and witness the best of St. Albert in St. Albert’s Got Talent! The Hummingbird Gala, presented by Nordic, is a gala hosted every year on behalf of the Alberta Diabetes Foundation. This year the Gala theme is “Paris Nights” and the ADF hopes to raise over $500,000 for Alberta based and life-changing diabetes research. Guests will be swept away to a charming evening in Paris where the food and wine are exquisite and the entertainment divine. This event will be held on April 26, 2019 at the Moonflower Room in the Enjoy Centre, St. Albert. 22nd annual High School Rodeo sanctioned by the Alberta High School Rodeo Assoc. Friday, April 12, 2019 Wrangler Jr. Rodeo ~ 12 pm Cattle Cutting Competition following the Jr. Rodeo Saturday, April 13, 2019 High School Rodeo ~ 12 pm Sunday, April 14, 2019 High School Rodeo ~ 10 a.m. More info here. A multi-generational music camp offering quality instruction in Fiddle, Piano & Guitar for musicians young & old alike. Four classes/day, jam sessions, dancing, concerts, good food, fun & friendships are on the menu. Register online at www.campcalvin.ca, For more information, contact Rhea at 780-645-0207. 7-8:45 p.m., the second and fourth Thursday of each month at the Stony Plain Public Library, 4613-52 Ave. Free. All welcome . Come listen or share your own poems! Info: 780-222-0452, parklandpoets@gmail.com. The Stony Plain Farmers’ Market is open from 9 a.m. to 1 p.m. every Saturday with two levels of amazing shopping. We are located in downtown Stony Plain at the Community Centre 5008 – 51 Ave. Doors open at 6 p.m. Food and refreshments available at a modest cost. Hosted at the Vegreville Sunshine Club. www.perogiesandjam.com for more info. Going into our 15th year! How exciting!! This annual event is organized by local business women to support local small and home based businesses. Please come down and show your support for our local business. Free admission Refreshments served. The Town of Westlock Fire & Rescue Services invites you to join us at the 2019 Firefighter Appreciation Ball. Featuring Comedian Bryan Hatt (Yuk Yuk’s, Comedy Now!, Halifax comedy Fest). Tickets $45.00 each Westlock Memorial Hall Cocktails – 5:00 p.m. Dinner – 6:00 p.m. Silent Auction / Dance to Follow / DJ Services provided by Bert Jubinville. 5 to 7 p.m. Westlock RC Flyers meet at the flying field beside the moto cross track every Tuesday at 5 p.m.
Mr. Rayz from Mr. Rayz Music For Kidz will be on site to get you smiling and dancing as we go on this adventure together. Showtimes are 1:30 and 3:00 p.m. Wondering what he’s all about? Check out his website at www.mrrayz.com for more information. Westward Community Yard Sale will be held on May 4 and 5 from 10 a.m. to 3 p.m. Space available for rent in the hall and admission is free! The Westward is located 8 kms south on HWY 32 on TWP RD 593A. For more information call Sharlene at 780-779-4343.